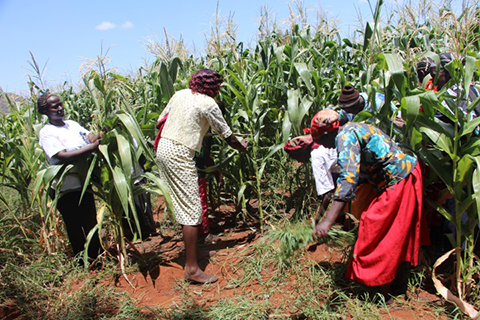 WMI's mission is to establish village-level loan hubs, administered by local women, to provide capital, training and support services to rural women in the lowest income brackets in East Africa so that they can engage in income producing activities. WMI celebrates 10th anniversary with new video by Local Director, Olive Wolimbwa, discussing WMI's 10 year impact. WMI is a participating member of CFC. We welcome your contributions! WMI's CFC number is 40340. WMI is proud to have been awarded a Dining for Women sustaining grant in the amount of $25,000/year for 3 years. DFW is empowering women and girls living in extreme poverty. Goal: WMI's goal is to help women build assets so that they can stabilize their income, raise their standard of living and reorient themselves and their families. WMI's small loans bring big changes to impoverished women, who use the money to build small businesses. With pro bono legal assistance from the law firm of Baker & McKenzie in New York, WMI issued its first microloans in January 2008. By year end 2017, it had issued 40,000 loans totaling $5 million to women in more than 1,500 villages. WMI has developed a unique economic model to transition women to institutional banking and the formal economy in 24-months. Loan funds are recycled so that the program becomes self-sustaining. WMI is making financial inclusion a reality for village women in East Africa. 10 year operating history in rural East Africa - approximately 98% repayment rate. Over 40,000 business loans issued; over $5,000,000 lent. Currently on track to issue 10,000 loans per year to rural women in Uganda, Kenya and Tanzania. Loan hubs managed by and for rural women through their own registered women's groups. Loan Program income retained by the women's groups managing the loan hubs. Loan Program operations are self-sustaining after 36 months of funding. Excess income after expenses is used for community projects like clean water and health screenings. Human capacity building at the village-level through intensive training programs for local women. Construction of village-level loan hubs that are easily accessed by rural women. Twenty-member loan solidarity groups use social capital as collateral to foster loan repayment. Peer-to-peer knowledge transfer and business skills training by trained village women. Surveys document program impact of measureable improvements in household living standards. Robyn Nietert, WMI's President, talks about WMI's triple bottom line impact from WMI's first loan hub in Buyobo, Uganda. ©2008-. Women's Microfinance Initiative. All rights reserved. No content on this web site may be reproduced without the written permission of WMI.